The 2001 UEFA Champions League Final was a football match that took place at San Siro in Milan, Italy, on 23 May 2001, to decide the winner of the 2000–01 UEFA Champions League. The match pitted German side Bayern Munich against Spanish side Valencia. The match finished in a 1–1 draw, but Bayern clinched their fourth title by winning 5–4 on penalties. This was also their first European Cup title in a quarter-century, also representing Valencia's second consecutive final defeat (2000 and 2001). Due to all the goals scored by penalties and the penalty shootout needed to decide the winner, this UEFA Champions League match became an "all-penalty" final and the only one ever to happen to this day. 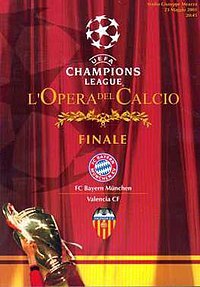 The 2001 final saw the two previous seasons' losing finalists clash, Bayern Munich lost to Manchester United in the 1999 final and Valencia lost to Real Madrid in the 2000 final. This was the sixth European Cup final to be decided on penalties, and the second under the Champions League format. This was Héctor Cúper's third consecutive European final defeat (after his Mallorca side lost the 1999 Cup Winners' Cup Final and Valencia lost to Real Madrid in the 2000 Champions League final) while Ottmar Hitzfeld claimed his second Champions League title after he won it with Borussia Dortmund in 1997. He became the second coach in European Cup history, after Ernst Happel, to win the competition with two clubs. This final would come to be known for the goalkeeping heroics of Bayern keeper Oliver Kahn. Valencia opened the score early on with a Gaizka Mendieta penalty in the third minute after a prostrate Patrik Andersson was deemed to have handled the ball in the penalty area. Only a few minutes later, Bayern Munich were awarded a penalty after Jocelyn Angloma fouled Stefan Effenberg in the penalty box, but Mehmet Scholl's kick was saved by the legs of Santiago Cañizares. Bayern were awarded another penalty early in the second half, this time after Amedeo Carboni handled the ball while competing for a header with Carsten Jancker. This time, Stefan Effenberg took the penalty kick and sent Cañizares the wrong way to level the scores at 1–1. The scores remained level for the remainder of normal time and throughout the 30 minutes of extra time, so the match went to penalties. Again, Valencia took the lead early on as Paulo Sérgio put the first kick of the shoot-out over the bar before Mendieta sent Oliver Kahn the wrong way. Hasan Salihamidžić, John Carew and Alexander Zickler then traded penalty goals before Kahn saved Zlatko Zahovič's kick to tie the scores at 2–2 after three kicks each. The next kick from Patrik Andersson was also saved by Cañizares, and then Kahn stretched out a hand to tip Amedeo Carboni's shot onto the crossbar. Both Rubén Baraja and Stefan Effenberg then scored to take the shoot-out to sudden death. Bixente Lizarazu and Kily González both scored their clubs' sixth kicks of the penalty shoot-out, and then Thomas Linke scored for Bayern to set Mauricio Pellegrino up for the game-deciding kick. Kahn guessed the right direction and saved Pellegrino's kick, winning the cup for Bayern Munich. Penalty shoot-out if no goals occur in extra time. ^ a b c d e "Match officials appointed for Milan final" (PDF). UEFA.com. Union of European Football Associations. 21 May 2001. Retrieved 13 July 2012. ^ "History | Weather Underground". Wunderground.com. Retrieved 30 June 2012. ^ a b c Matt Biggs (23 May 2001). "Bayern Munich 1 - 1 Valencia; Bayern won 5-4 on penalties". The Guardian. Retrieved 2 December 2018.